The IoT devices you have in your home are designed to make your life easier, but connecting them all together can be very complex. Products from one company might not work well with products from another. 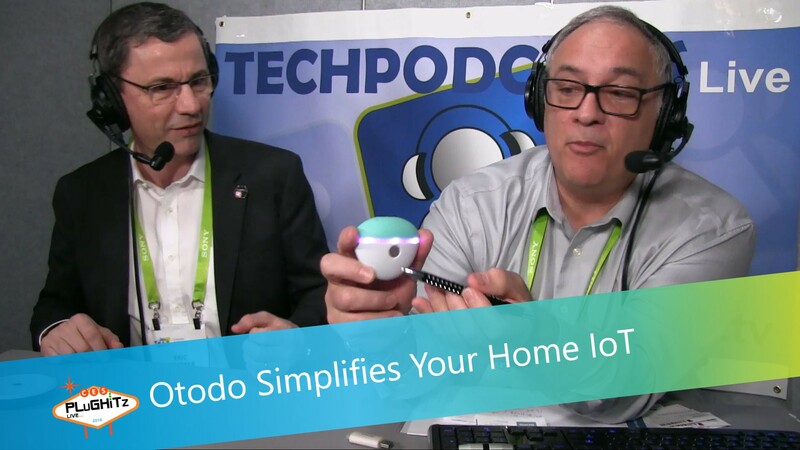 Otodo simplifies your IoT with their smarthome solution. Don spoke with Eric from Otodo at CES 2018. The Otodo smarthome solution uses two products: the Otodo One and the Ugo. The Otodo One is a hub that allows you to manage many commercial connected objects, and also older remote controlled devices (such as lamps and thermostats) from different brands. It functions as the bridge between your internet provider and all your home IoT objects. The Ugo is an aesthetically pleasing smart pebble remote that helps you to interact with all your connected devices at home. The Ugo stays in your house (you may want to put near your door). Use the app to pre-program a specific location and associate it with one IoT device (for example, a light). Pick up the Ugo pebble and tap it twice on that location and the light will come on. The Ugo pebble can only be used by the people in your family, but the Ugo will not function if an unidentified person picks it up. It is very specific, so you won't have to worry about accidentally turning off your neighbor's lights. Otodo is expecting to have these products in the United States later this year. Otodo One will be priced at approximately $30 to $40. Ugo will be priced at $69.